We humans are the only primates that can flexibly control the pitch of our voices. This melodic control is not just important for our singing abilities: Fluctuating pitch also conveys critical information during speech—including the speaker's mood, words of emphasis, or whether a sentence is a statement or a question. Some tonal languages, like Mandarin Chinese, even use pitch to give different meanings to otherwise identical words. Now, new research by UC San Francisco scientists reveals what area of the human brain controls the vocal folds of the larynx, or voice box, to let us control the pitch of our speech. Insights into pitch control could pave the way for advanced brain prosthetics that could allow people who can't speak to express themselves in a naturalistic way. The study, published June 28, 2018, in Cell, was conducted by Benjamin Dichter, Ph.D., a postdoctoral researcher in the laboratory of senior author Edward F. Chang, MD, professor of neurological surgery and member of the UCSF Weill Institute for Neurosciences. They were joined by Jonathan D. Breshears, MD, and Matthew K. Leonard, Ph.D., also of UCSF. Chang's lab recently showed how one part of the brain controls the lip, tongue, and throat muscles to produce the fluid combinations of vowels and consonants that make up the principal phonetic sounds of speech. Their new study shows that a different region of the brain independently governs the "music" of speech. When you push air through the larynx, you can control how quickly your vocal cords vibrate based on the tension you place on them. Much like tightening a guitar string, increasing tension in those folds by flexing your larynx muscles causes them to vibrate faster, and results in sound or speech with a different pitch. But only a few species are capable of learning to flexibly control vocal pitch. "Control of the larynx is a key step in the evolution of spoken language," said Dichter. But to understand how the brain controls the larynx during speech, researchers need insight into what is happening in the brain in real time while people speak, added Chang, who was named the William K. Bowes Jr. Biomedical Investigator in March, 2018. "Understanding how we speak goes far beyond just knowing where speech functions are localized in the brain. Even more important is to understand how brain cells actually encode the command signals for the muscles of the mouth and throat that make speech possible." As a neurosurgeon at the UCSF Epilepsy Center, Chang performs operations to excise brain tissue that causes seizures. Some of Chang's epilepsy patients are fitted with high-density arrays of tiny electrodes on the surface of their brains to help pinpoint the genesis of their seizures. The researchers recruit volunteers from this patient group for research studies like the new study, which require a precise examination of neural activity during certain speech tasks. This method, known as electrocorticography, or ECoG, helped the team identify what areas of the brain, and which specific clusters of neurons, were activated when the patients emphasized different words while speaking. In the new Cell study, the researchers studied how the brains of these volunteers modulated changes in pitch to emphasize different words in the sentence "I never said she stole my money." Volunteers read the sentence multiple times, emphasizing a different word each time, which subtly changed the meaning of the sentence. (For example, "I never said she stole my money" implies someone else made the accusation, whereas "I never said she stole my money" implies you accused her of stealing something else.) This way the researchers could look at differences in brain activity due to how speakers emphasized different words in the sentence by changing pitch, without changing the words being spoken. 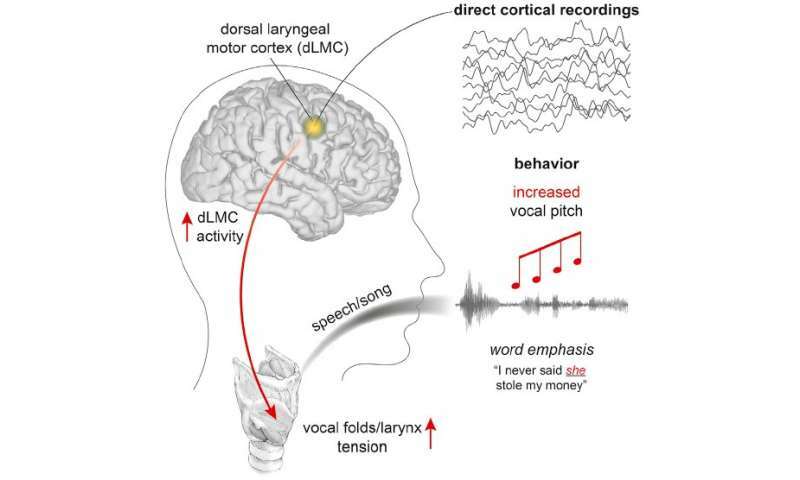 They found that activation of neurons in one brain area, called the dorsal laryngeal motor cortex, was linked with quick changes in pitch, such as when different words are emphasized in a sentence. The more active that area of the cortex was, the higher the speaker's pitch on individual words. This was true both during speech as well as when the patients were singing a simple melody. Neurons in a nearby brain area activated when a speaker changed the overall pitch of her or his voice, as we sometimes do when we speak in a higher pitch to pets or children. What's more, the researchers found that dorsal laryngeal motor cortex also responds to pitch when the patients silently listened to their own speech played back. According to Dichter, this brain area does not appear to be used in the same way in other primates, and the finding that it takes part in perceiving as well as producing pitch changes might yield clues about how our brains allow us to mimic one another's speech, and to intentionally change the pitch of our voice. Dichter said the group's next project is already underway—exploring whether they might be able to "reverse engineer" how the brain controls pitch: "Can we predict which word is being emphasized by a speaker just by looking at their neural activity?" Developing a speech prosthetic that could lend nuanced, naturalistic voices to those unable to speak is another direction for the team to pursue. "You'd really like a prosthetic to carry the emotional content of the speaker," Dichter said. "It's not enough to just capture the words, because so much of what we communicate is how we say something."